While it won't really improve anything on single-user systems, it offers privacy in situations where a computer is shared. This can be a family computer, a public computer in a library or on campus, or your own computer that you hand over sometimes to others because they just need to look something up fast. Private browsing prevents the saving of data that is usually stored by the browser when it is being used. This includes temporary Internet files, site cookies, the browsing history and other session related bits of data. While it does not offer 100% protection against prying eyes, as some information may still get recorded -- the Windows DNS Cache comes to mind -- , it can still be useful if you know about its limitations. Firefox's private browsing mode enables you to launch a private window during the session. If you do so, the browser won't record data of that session. Add-ons like per-tab private browsing improve that feature. Instead of having to launch a window every time you want to run a site in private browsing mode, you can launch it in the current window instead. There is also an option to make private browsing mode the default start mode of Firefox. Auto Private is a new extension for the Firefox web browser which adds another useful option to it. You can use it to always load select sites in private browsing mode in Firefox. Whenever you type in the site in Firefox's address bar or click on a link in the browser or another program, it will automatically be loaded in a private tab in Firefox if it matches an url that you have added to the list of sites you want opened in that mode. The extension uses two about:config preferences that you use to configure which sites get loaded in private browsing mode. Type about:config in Firefox's address bar and hit enter. Confirm you will be careful, and use the search to find the following two preferences. This preference is for individual domain names. Add a list of domains, e.g. 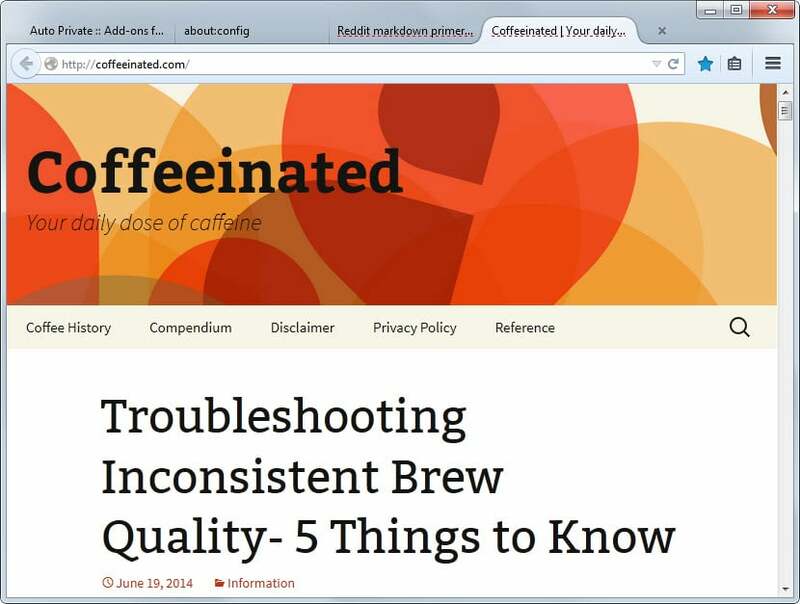 coffeeinated.com;reddit.com;www.google.com; and the extension will load those sites in private mode whenever they are loaded. Domains need to be separated by ; without spaces in between. The extension tries to match what you enter; reddit.com for instance will match reddit.com, www.reddit.com or www.reddit.com/r/soccer/. The second preference supports wildcards (*) that you can make use of to match specific parts of a site only. You can enter google. * for example to run all google domains regardless of domain extension in private browsing mode. All sites opened as private tabs are highlighted with a red underline so that you can distinguish between normal mode and private mode easily. Note that anyone with access to the browser can -- at least in theory -- look up the sites that you have added to the two configuration preferences which may reveal information about sites you visit. Auto Private for Firefox is a useful extension, especially for users who like to run select sites always in private browsing mode to avoid that visits are recorded by the browser. Chrome users can check out Ghost Icognito which does the same thing. This said, the well-known Private Tab add-on, mentioned here as well, has an interesting feature providing similar functionality to the AutoPrivate extension, which is that you can create private bookmarks to always open some links in private tabs by just appending private: before URL, example: private:https://addons.mozilla.org/ . This remains however per-url and not domain-wide as the new extension offers. The link is listed in the summary section at the end of the article. I had searched on Mozilla for Auto Private and for AutoPrivate, now even Auto-Private does not render any result. Their search engine remains lousy. Thanks for the link, got it. Tom Hawack the search engine is working fine. great idea, but the tabs you open out of an auto private tab aren’t private anymore. Oh really? Damn! If the new tabs that open from Auto Private aren’t private as well, then I guess I’ll have to stick to Private Tab. Got excited there. Ok .. I gave auto-private a whirl and I was happy with it at first. On about the 3rd restart of FF (30), all of a sudden ALL sites were opening in private tabs, not just the ones I had set in the config. I removed the addon and everything was back to normal. Not sure what happened as it was working for the first few FF starts (so it was configured properly) …. I feel like this addon should have an interface of its own to maintain a searchable list of domains. I wonder if this works hand in hand with Private-tab, perhaps a better option would be if private-tab was able to do this also (as an option) instead of depending on two different developers.